The democratization of financial services data and technology, together with more intense competition, makes the needs of today’s market participants vastly different from those of previous generations. Firms must locate untapped sources of data for both public and non-public companies. This alternative data, such as payment data and other non-public information, from sources beyond the common channels, can be a predictive indicator of market performance; a difference maker in assisting firms as they develop models to evaluate their investments. By combining our unique data sets with advanced analytics, traders, analysts and managers can seek predictive signals and actionable information utilizing their own models. 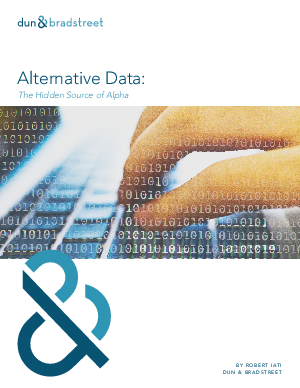 View our research report to learn how alternative data, our 'Information Alpha,' can help you earn differentiated investment returns.